I have GSM gateway Portech MV-370 and it works well. I can make incoming calls and outgoing too. I want to dial from a mobile to the GSM number in the gateway and trough it I want to connect to elastix. Than through tiping DTMF I want to call outside on normal pstn or cellular network. So my only personal cost would be to call the GSM number that is in the gateway (but I have a provider that have free cals in my company, so there will be no personal cost to dial through elastix with regular mobile phone, ex some old drity nokia that doesn't have SIP )! Any tips for it?! Someone had some similar expirience?! From what little I understood. A normal person from my company that doesn't have a sip on their mobiles I want to afford them to connect to the elastix without IP phone, only with their mobiles. 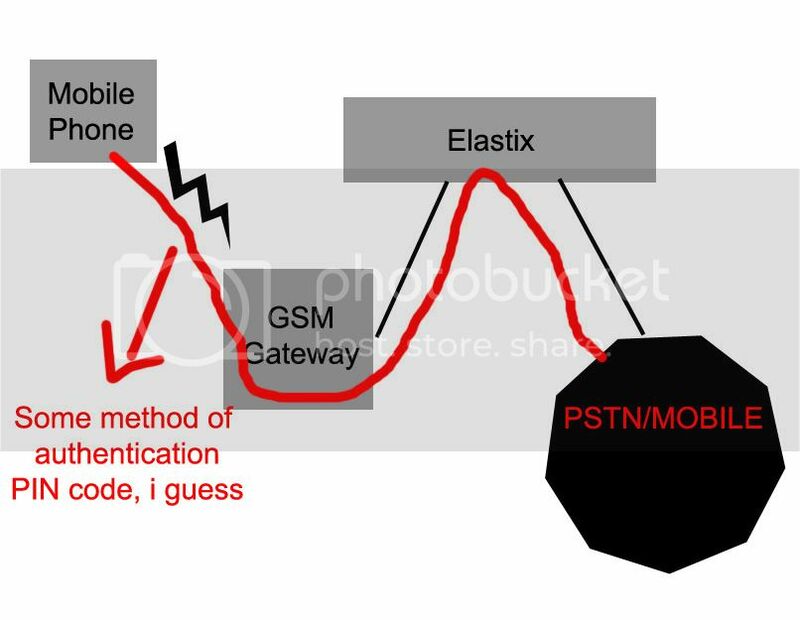 So I want to use the GSM gateway as a bridge to connect to the elastix and to register as a extension there so someone can call to mobile/pstn through elastix . That's all. so my idea is: Mobile Phone -> (dial to GSM Gateway) -> GSM gateway responds -> Mobile phone dial DTMF the number that a person wish to call -> GSM gateway through Elastix call that number. So if I want to call 123456 I need first to dial 654321 (GSM gateway sim card number) and after I hear some tone or something, with DTMF I enter 123456 and through elastix dial straight to that nubmer. If you can, with DISA in the elastix you can do it. I have the same setup and are trying to do the same thing. However I cannot get incoming to work properly. In your setup what do you get when you call in: The MV's extension or IVR. I believe you have to do it with DISA too but I want to know how you receive your calls. Ok dude, I didn't posted here for a while but i did it 2 weeks ago. Its quite intuive and easy. You can easily set a CID to make sure that only few number can use the conneciton to a lan. Call from GSM mobile to Portech. Portech goes to Elastix. Elastix hangs up. Than after 5 seconds (time that you setup in elastix) Elastix calls the CID that called the Portech earlier. If some picks up than a tone plays and wait for DTMF. You enter you keys and than to call goes out through elastix. So, you if you are the caller you don't have any costs. That's why you should be careful with secirity, you may someday see a miliondollar bill !